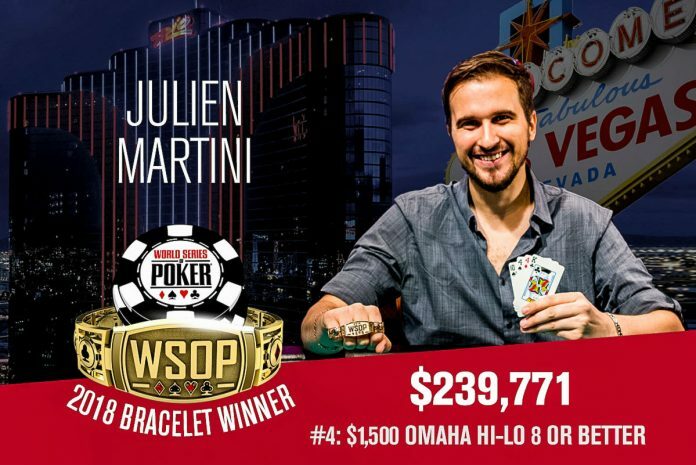 Julien Martini was one of two French players to win a bracelet on Sunday. (WSOP photo). Sunday at the 2018 World Series of Poker was a busy one with thousands of players battling on the felt at the Rio as well as the virtual felt of WSOP.com. It ended up being a big day for France, with both bracelets won on Sunday going to French players. Julien Martini used to watch poker on TV in awe of the big names and the even bigger stakes. That was on his mind Sunday afternoon as he beat Kate Hoang to win his first career WSOP bracelet and $239,771. Martini and the other three players who returned to the table on Sunday were supposed to be doing something else. Originally scheduled to end on Saturday, the event needed an extra day to finish thanks to a bigger-than-expected field of 911 players. This is the second time in three years that Hoang finished runner-up in an Omaha Hi-Lo event at the WSOP. In 2016, she finished second to Kyle Bowker in the $3,000 Pot Limit Omaha Hi-Lo event. Other notables that cashed in the event include Chris Bjorin (17th – $8,296), Daniel Buzgon (18th – $8,296), Mike Leah (30th – $5,605), Jerry Wong (33rd – $5,605), Benny Glaser (63rd – $3,526), John Racener (86th – $2,595). Just five events into the 2018 WSOP, Elio Fox has already won one WSOP bracelet and now he’s suddenly at a final table with a chance at a second. But he’s not the headliner. Fox sits third in chips at the $100,000 Super High Roller final table behind Nick Petrangelo and Bryn Kenney. Stephen Chidwick, the #1-ranked player on the Global Poker Index, sits sixth. Sunday’s play started with 10 players still in contention and Petrangelo was firmly planted at the top and he stayed there as Adrian Mateos, Fedor Holz, Chris Moore and Jason Koon all fell by the wayside. Petrangelo, Kenney and Fox have all won a WSOP bracelet before, while the three players making up the bottom half of the chip counts, Andreas Elier, Aymon Hata, and Chidwick, have not. Play resumes Monday at 6 pm ET and will be streamed on PokerGO. Two more starting flights of the $565 Colossus made sure that the tables at the Rio were jam-packed with players of all skill levels taking a shot at a potentially huge return. After 3,495 players played Saturday’s two flights, 3,519 more showed up on Sunday. Nobody enjoyed Flight 1C more than Romanian Florian Duta. He bagged up 442,000 – almost twice as much as the next biggest stack from 1C. That stack of 241,000 belongs to WSOP bracelet winner John Racener. While Duta’s stack is impressive, Philip Alberquerque did even better later in the day. The American finished Flight 1D with 503,000 and finds himself sitting second overall behind Day 1A leader Anthony Parill, who finished with 607,000. For the 2018 event to reach the 18,054-player field size, Flights 1E and 1F on Monday will need to average 5,520 players each. The final two flights last year had 3,966 and 3,923 players respectively. Two years ago, Chris Vitch won his first WSOP bracelet in the $2,500 Mixed Triple Draw Lowball event. He followed that up in 2017 by winning the $10,000 Seven Card Stud Hi-Lo event. Now, he’s in position to win his third career bracelet and doing it the event that started his winning trend. Vitch bagged up 493,000 chips to lead the final 12 players in the $2,500 Mixed Triple Draw Lowball event. The group chasing him includes Scott Seiver, Bryce Yockey, Frank Kassela and Mike Leah. The day began with over 90 players still chasing the bracelet. There were 37 players who busted on Sunday who did manage to get into the money before their tournament ended. Included in that group was Chris Ferguson picking up his first cash of 2018 (48th – $3,721). Some of the big names who picked up a result on Sunday included Ismael Bojang (47th – $3,721), Shaun Deeb (37th – $3,937), Jon Turner (32nd – $4,329), John Monnette (21st – $5,847), Billy Baxter (18th – $7,163) and Brian Hastings ($14th – $7,163). The second $10,000 “Championship” event of the 2018 WSOP started Sunday afternoon as 161 players showed up for the $10,000 Omaha Hi-Lo Championship. Through eight levels of play, 86 players were eliminated but Chris Bjorin was most definitely not one of them. Bjorin finished Day 1 of the event with 249,500, good enough for the overnight chip lead. Right behind him is Jesse Martin, Daniel Ratigan, and Steve Chanthabouasy. Another eight levels are scheduled for Monday starting at 5 pm ET. For the first time in WSOP history, players in more than one state were playing online for a WSOP bracelet on Sunday. A record-smashing 2,972 entries pushed the total prize pool to $974,816 – well past the $500,000 guarantee. Taking home the winner’s share of that and his first career WSOP bracelet was Frenchmen William ‘Twooopair’ Reymond. At the start of the tournament, Reymond was happy just to be clicking buttons. Shawn ‘sHaDySTeeM’ Stroke took home $94,265 for his runner-up performance. To the surprise of nobody, Anthony ‘nowb3athat’ Spinella made the final table and eventually finished seventh for $21,251. Spinella won the very first online bracelet in 2015 and earlier this year became the first to win a WSOP Circuit ring playing on WSOP.com.